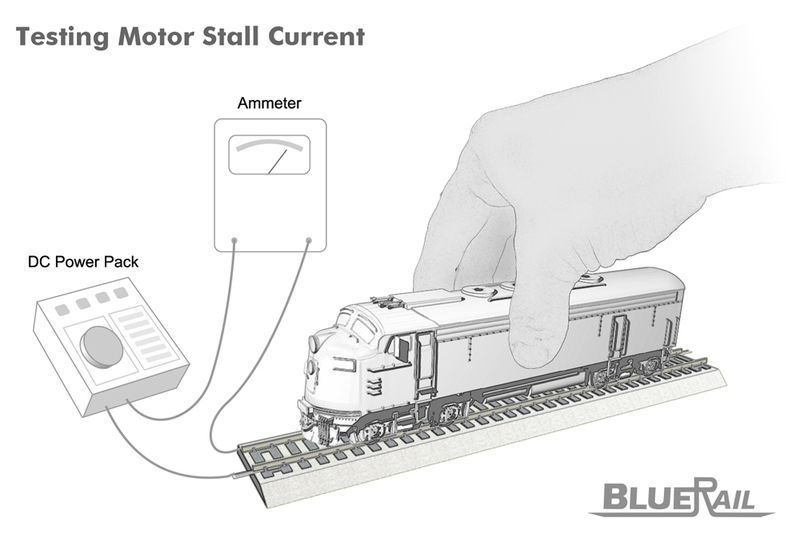 It is important to test your locomotive’s stall current to make sure it is compatible with this BlueRail board. 1) Set your locomotive on a section of track with a DC power-pack powered at the maximum voltage you would operate your train (typically 12-16 volts). 2) Connect a DC Ammeter in series with one of the track feeders (as in the diagram). 3) Hold the locomotive firmly in your hands (so it can’t move), pressing down on the locomotive to prevent the wheels from spinning, and power up the power-pack. 4) Make sure the power-pack voltage remains constant (to get an accurate reading) at the maximum voltage you intend to run your train. 5) Measure and note the current the locomotive is drawing. This is your locomotive’s “stall current”. If your stall current exceeds 2 amps please read THIS ARTICLE. If you are testing your loco’s SLIP CURRENT, use the same procedure, but hold your loco with lighter pressure (so the wheels are able to SLIP). A loco with a slip current of 2 or less will work with this board. Please see more detail on “Overload Protection” for more details on the board’s current draw limitations. For larger scale locos, if you are measuring your loco’s stall current, it is also worthwhile to find out your loco’s “slip” stall current. That is, the maximum current draw at the point where your loco’s wheels begin “slipping”. (This is usually a factor of whether your loco has traction bands on the wheels.) You can measure this by performing the test above, but only pushing down hard enough till the loco wheels are just beginning to slip, and noting the amperage reading. A Bachmann Large scale 4-6-0 might have a hard stall current of 4.6, but have a “slip” stall current of 1.5 – meaning the wheels will start spinning once you reach 1.5 amps (and will probably never reach 4.6 unless you add extra weight in the loco or traction bands). You might base your assessment of whether the first BlueRail board is suitable for your loco on the “slip” stall current (rather then the “hard” stall current).